by Brianna Crandall — February 28, 2018 — Muscatine, Iowa-based workplace furniture manufacturer The HON Company recently announced three versatile furniture collections designed to support a variety of work styles and spaces, with simple installation and reconfigurability for facilities managers. 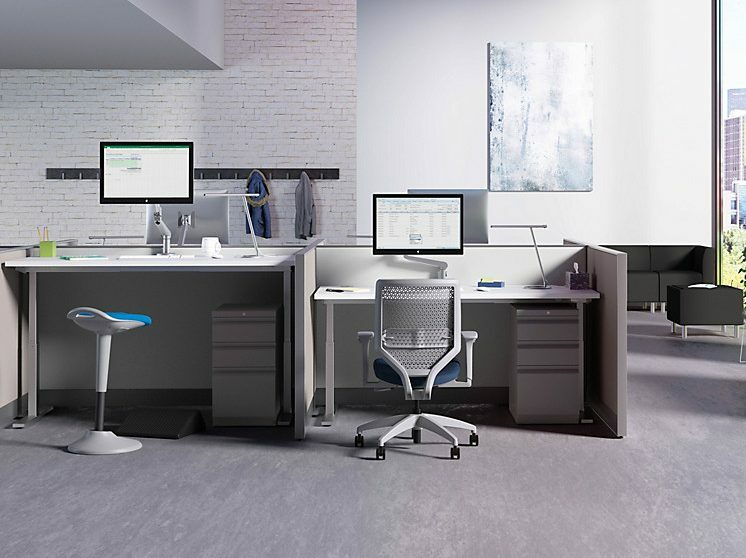 Coordinate height-adjustable bases and desktop risers provide a seamless transition from sitting to standing, promoting movement and changing posture throughout the day to support a healthier, more ergonomically friendly workspace. The height-adjustable bases work with dedicated rectangle or corner cove worksurfaces and any HON worksurface, including Voi, 10500 Series, Preside and Foundation. Desktop risers quickly turn any desk or table into a sit-to-stand workstation in minutes without modifying the base or frame. All Coordinate bases are a three-stage design, with both two- and three-leg models available to adapt to different work styles. Each base can be quickly and easily attached to a HON worksurface or retrofitted to many existing worksurfaces to give instant sit-to-stand support. Plus, the motor and steel frame have met rigorous testing standards to ensure a high-performance workspace for years to come. The products ship with memory control standard, which allows the worksurface to move to one of four pre-set levels. Whether it’s an open plan, private office or training, these bases are designed to adapt to any workspace layout or need. For more information, see the Coordinate photo gallery and fact sheet on the HON Web site. HON Foundation is designed to create a solid starting point for success. This versatile collection of laminate desk and storage solutions can be combined and adapted in a variety of ways to fit any work style or space, from private offices to open, collaborative spaces to reception areas and meeting rooms. Foundation worksurfaces can be paired with Coordinate Height-Adjustable Bases to promote a healthier work style. Lateral files and storage pedestals come fully assembled, and desks and credenzas assemble easily in minutes, says the company. All components feature attractive scratch- and stain-resistant laminate for a combination of beauty and durability. Components are available in three HON laminate colors — Shaker Cherry, Mahogany and Pinnacle, with four handle designs for even greater personalization, and frosted glass modesty panels for additional privacy. For more information, see the Foundation photo gallery and fact sheet on the HON Web site. 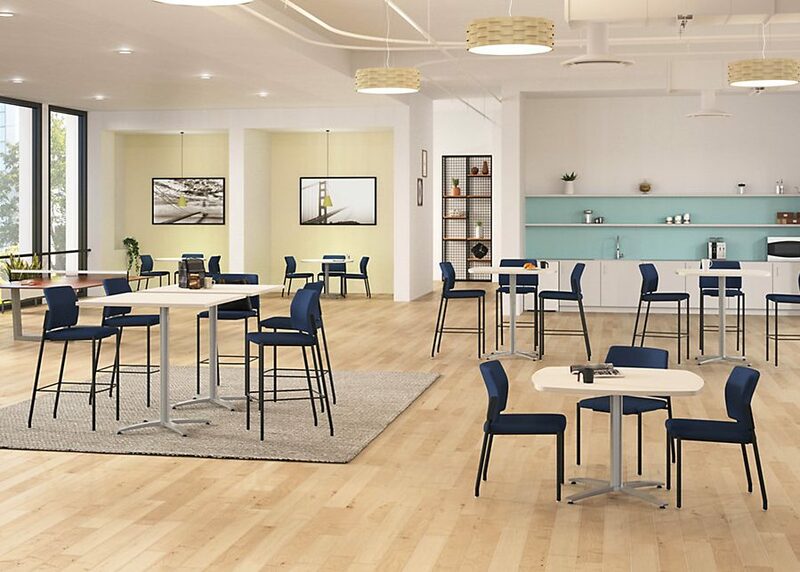 With both standing- and seated-height options, Between tables can be used in multiple areas throughout the office such as breakrooms, cafés, or breakaway spaces that support today’s agile workforce. The variety of table top shapes and base sizes also make these tables easy to use in designated meeting spaces or casual open areas, helping you get the most value out of every inch of space by creating hubs for people to engage, socialize and be productive. This versatile, lightweight table line with a simple X-Base design is easy to specify and reconfigure, all at a competitive price point, says HON. A top bracket connects the upright and the base for easy assembly. Glides offer easy adjustability, and hard casters are said to move effortlessly on any surface. Table tops come in three shapes — Round, Square and Soft Square — and three sizes: 30”, 36” and 42”, with high-pressure laminate and a 2mm edge band. Two base paint colors are available — Textured Silver and Black Mica Texture, and multiple durable, high-quality laminate and edge finishes that coordinate with other HON product lines. For more information, see the Between Tables photo gallery and fact sheet on the HON Web site. All the furniture products highlighted above are made in the US. Coordinate and Foundation are backed by the HON Limited 5-Year Warranty, and Between is backed by the HON Lifetime Warranty.